LOOKING FOR SOME EXTRA ZING IN YOUR KITCHEN TONIGHT? The best chefs in the world including Jamie Oliver will tell you the marvels of this product. For example, you haven't tasted a roasted potato until you have cooked it in duck fat. 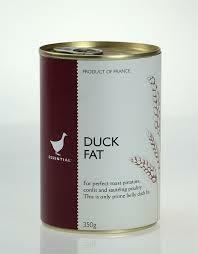 But duck fat’s most remarkable quality is its taste.